Fifteen games into his professional career, Isaiah Clark's career was put on hold. A knee injury forced the Brewers first-round pick to sit for the rest of that season - and the next. "It was really the most terrible time of my life," Clark told The Milwaukee Journal in May 1986 of the surgeries and rehab. "I'd never had so many bad moments, so many downs. It really made me a mature person. I learned a lot." Clark came back from that 1984 injury to play in six seasons, but they were seasons spent in the minors. Clark only got as high as AA, never making the majors. Clark's career began that year in 1983, taken by the Brewers in the first round out of Crockett High School in Crockett, Texas. Sent to rookie-league Paintsville, Clark played in just those 15 games, getting 10 hits in 57 at bats. Then came his knee injury. 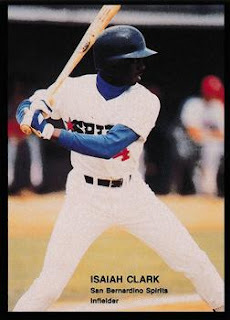 Coming back nearly two years later, Clark played 1986 at single-A Beloit and rookie league Helena. He hit .277 with 12 home runs between them. For 1987, Clark moved on to single-A Stockton. He hit just .230, with four home runs. It was his final full year with the Brewers system. He started 1988 back at single-A Beloit. Then, in May, the Brewers traded him to the Athletics, getting three players in return. He played the rest of the season back in the California League at Modesto, hitting .265. Clark got two hits in one early June game, contributed to a run with a double in an August outing. Clark moved on to the Padres system for 1989, playing at single-A Riverside. Clark finished out his career in 1990, with the Mariners. He started that season at single-A San Bernardino, finishing it with his only trip to AA at Williamsport. While Clark never made the majors, two of his brothers did, Phil and Jerald Clark. Phil Clark played parts of five seasons in the majors, from 1992 to 1996. Jerald Clark played parts of seven, from 1988 to 1995.